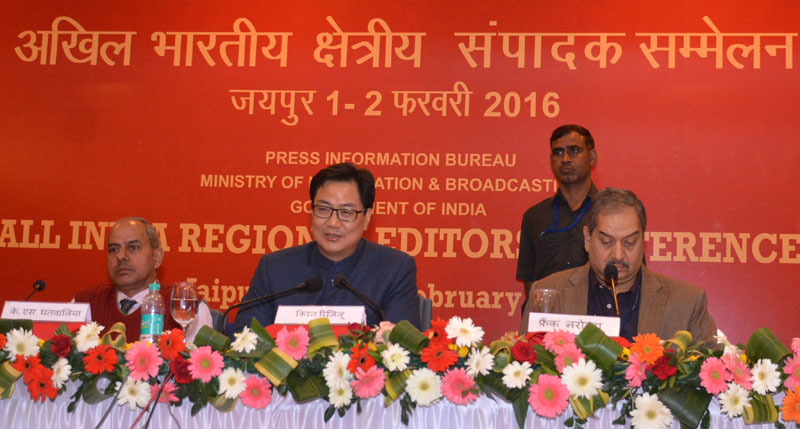 The Union Minister of State for Home Affairs, Shri Kiren Rijiju addressed the All India Regional Editors Conference at Jaipur today. He shared with the regional editors the initiatives taken by the Ministry of Home Affairs on Disaster Management. • The National Disaster Response Force (NDRF) which was set up to provide immediate response in case of disasters, is being strengthened further both in terms state-of-the-art training and equipment, has emerged as a professional response force. NDRF is not only doing a stupendous job in addressing national disasters but responding to disasters in the region and beyond. India helped during Japan Earthquake in 2011 in disaster response. India envisages a bigger role in capacity building in the Asia-Pacific region and looking forward to build sustained regional and international partnerships under the Sendai Framework 2015-2030. • As a part of institutional strengthening, the Government of India has constituted the NDRF Academy by merging the National Fire Service College (NFSC), Nagpur and National Civil Defence College, (NCDC), Nagpur. The NDRF Academy would provide advanced search & rescue training to personnel of Fire Service, NDRF and State Disaster Response Force. Headed by an officer in the rank of Inspector General (Training), the academy shall function under the overall guidance and control of MHA. • The Government of India with the approval of Home Minister has approved the constitution of Disaster Response Medal for the personnel of NDRF, who have served NDRF for at least three years. This initiative is to motivate and strengthen the morale of the primary responders of the NDRF who work in the most hazardous situations. Since inception, NDRF lost 9 rescuers in different operations while trying to save the victims. • The Government of India is firmly committed and is making consistent efforts to promote regional cooperation in the field of Disaster Risk Reduction. India hosted the SAARC Disaster Management Centre which worked upto Dec 2015 towards putting in place a comprehensive regional disaster management framework to reduce disaster risks and promoting knowledge sharing among the SAARC countries. India has plans to further strengthen this Centre. • The SAARC Agreement on Rapid Response to Natural Disasters signed on 11th November, 2011, institutionalizes the regional cooperation on disaster response among the member countries. It provides a mechanism for rapid response to disasters to achieve substantial reduction of disaster losses in lives and in the social, economic and environmental damages through concerted national efforts and intensified regional cooperation. Besides rapid response, the Agreement requires the incumbent member countries to organise periodic mock drills/forums in rotation, wherein other Member States be invited to test the effectiveness of regional preparedness for response. Accordingly, the SADMEX 2015 was organized in Nov. 2015 by the NDRF in Delhi. The joint exercise addressed the important aspect of responding to disasters by pooling of resources and expertise and the imperative of presenting a well-coordinated response to disasters situation in any of the SAARC countries. • India has made proactive response measures to address some of the major crisis in the region. In December 2014, when the Maldivian capital faced an acute water crisis after a fire in the city's water treatment plant, India sent an Indian Air Force transport aircraft and naval vessels carrying a large consignment of water to meet the immediate requirement of over 100,000 people. • In a major rescue mission in April 2015 in Yemen, India evacuated about 4640 Indian nationals and nearly 960 foreign citizens of 32 countries when the country was facing the civil war like situation. During that mission, Indian Air Force and Navy were deployed. • In July, 2015, twelve Regions and States of Myanmar have been severely affected by Cyclone Komen, which has led to widespread floods and landslides in that country. Around 250,000 people have been affected and over 500,000 acres of farmland destroyed. Government of India was specifically requested by the Government of Myanmar to send emergency supplies of rice and medicines by air to locations that are currently hard to reach through other means. In response, India had dispatched about 100-tonne load of rice and noodles and 10 tones of medicines were dispatched emergency relief supplies to Myanmar. • In the wake of devastating earthquake in Nepal, the National Disaster Response Force was deployed within 5 hours, assisting Nepalese Government in their rescue and relief operations. Government of India provided relief materials like food, water, medicines, tents, blankets, tarpaulin amounting to about Rs.327 crores. Further, besides technical assistance, India has further committed USD 2 billion to Nepal for rebuilding Nepal. • The Indian National Centre for Ocean Information Services (INCOIS), in Hyderabad, provides early warning not only to India, but also to 28 countries in the Indian Ocean Rim. • The National Institute of Disaster Management (NIDM) and Jawaharlal Nehru University (JNU), New Delhi, on 6th August, 2015 in recognition of their areas of academic and administrative research, education and training in disaster management has signed a Memorandum of Understanding (MoU). The MoU will lead to enhanced academic cooperation between the institutions for establishment of a Centre for Excellence in Disaster Research and Resilience Building at JNU promoting research, capacity building and manpower development within a multi-disciplinary framework. • In an effort to demystify the Sendai Framework for Action, the Ministry of Home Affairs has issued a set of priority actions to the all the State Governments. This set of guidelines is as per the goals, targets and priorities of Sendai Framework 2015-2030. • India in pursuit of its commitment towards Sendai Framework for substantial reduction of disaster risk in the Asian region, would be hosting the First Asian Ministerial Conference for Disaster Risk Reduction in 14-17 November, 2016. The intended outcome of the conference is to develop a ‘Regional Action Plan for implementation of the Sendai Framework’. A dedicated Asian Ministerial Conference for Disaster Risk Reduction (AMCDRR) Secretariat with adequate physical and man power resources has been set in the Ministry of Home Affairs to undertake various activities pertaining to all preparatory work of the First AMCDRR. A dedicated electronic mail id has been created i.e., amcdrr.india@gov.in for doing all correspondence pertaining to AMCDRR. The website and logo have been developed and launched during Asia Leadership Meeting in Nov, 2015. • The Asia Leaders’ Meeting towards Implementation of the Sendai Framework for Disaster Risk Reduction in Asia was organized by Government of India on November 17, 2015 in New Delhi. The meeting was co-chaired by Shri Kiran Rijiju, Minister of State in the Ministry of Home Affairs and Ms. Margareta Whalstrom, Special Representative of the United Nations Secretary General for Disaster Risk Reduction. The Union Home Minister Shri Rajnath Singh also graced the occasion. The meeting was attended by about 120 key dignitaries and senior ministers from the nations of China, India, Indonesia, Japan, Malaysia, Mongolia, South Korea, and Thailand;, delegates from various countries and international organisations, and officials of Government of India and the State Governments. The aim of the meeting was to bring together Ministers from the countries that have hosted previous Asian Ministerial Conferences on Disaster Risk Reduction (AMCDRR) to set a future policy direction towards implementation of the Sendai Framework for Disaster Risk Reduction (SFDRR) 2015-2030 in Asia. During the meeting, the Minister of State for Home Affairs Kiren Rijiju was recognized as a ‘Champion for Disaster Risk Reduction’ for a series of policy decisions to strengthen disaster risk governance and partnerships in education, disaster preparedness and response in his country. The Asia Leaders Meeting was followed by second ISDR Asia Partnership (IAP) meeting, a key regional platform providing necessary consultations and technical support to implement the SFDRR 2015-2030. The focus of the meeting was to collectively set the policy direction for the implementation of SFDRR in Asia and discuss substantive preparations of the first AMCDRR, post Sendai Framework, which is scheduled to be held in India in Nov. 2016. Shri Kiren Rijiju also interacted with the editors and answered various queries and issues raised by the editors at the Jaipur conference. A delegation of Muslim clerics and social leaders called on the Union Home Minister Shri Rajnath Singh here in New Delhi today and discussed the issues concerning the community. The delegation emphasized that Indian Muslim youths have not fallen prey to any propaganda in the name of Islam and expressed satisfaction for the steps taken by the NDA Government for creating an atmosphere of peace and security in the minds of the minority community. Condemning all kind of violence in the name of religion the delegation explained that Islam stands for peace and wellbeing of all; and no one should be misguided or carry an understanding contrary to this fact. They also added that they were against any sort of terrorist or violence activities including cross-border terrorism. Highlighting the fact that Muslims were safe and enjoyed freedom in India the delegation said that this kind of freedom and security is not available to Muslims even in Muslim-ruled countries. The delegation also raised the issues of educational and economic backwardness and requested the government to take positive steps for their upliftment. It was also suggested that a forum for dialogue to strengthen communal harmony be created comprising of religious and social leaders from different communities and other stakeholders. The delegation included the names of Maulana Kalbe Jawwad, Prominent Shia cleric, Maulana Abdul Wahid Hussain Chisti, Chief of Dargah Ajmer Sharief, Ajmer, Niaz Faruqui, General Secretary, Jamait-Ul-Hind, Maulana Iqbal Ahmed Chisti, General Secretary, Maulana Wamiq Rafiq Warsi Sahab, Head, Dargah Dewa Sharief, Janab Mohibulla Nadvi, Chief Imam, Parliament Masjid, Maulana Mohammad Alim Nadvi, Haryana Imams Organization, Yamuna Nagar and Dr. M.J. Khan, National Convener, Muslim Economic Forum. Prominent among others in the delegation included S|hri Kamal Faruqui, Chairman, Confederation of Minorities Educational institutions and Shri Kamar Agha Noted Journalist and Expert on International Islamic affairs. 1. Appointment of Shri K.K. Sharma, IPS (RJ:82), Addl. DG, BSF as DG BSF w.e.f. the date of joining the post upto the date of his superannuation or until further orders whichever is earlier. 2. Appointment of Shri K. Durga Prasad, IPS (TG:81) presently working as Special DG, CRPF as DG, CRPF w.e.f. the date of joining the post upto the date of his superannuation or until further orders whichever is earlier. 3. Appointment of Smt. Archana Ramasundaram, IPS (TN:80) presently working as DG, NCRB as Director General SSB w.e.f. the date of joining the post upto the date of her superannuation or until further orders whichever is earlier. 4. Appointment of Shri M.K. Singla, IPS (KL:82) presently working as Addl. DG in BSF as Special Secretary (Internal Security), Ministry of Home Affairs w.e.f. the date of joining the post upto the date of his superannuation or until further orders whichever is earlier. 5. Appointment of Shri A.R.K. Kinni, IPS (BH:81), Special DG (in-situ), BPR&D as DG, NCRB w.e.f. the date of joining the post upto the date of his superannuation or until further orders whichever is earlier.